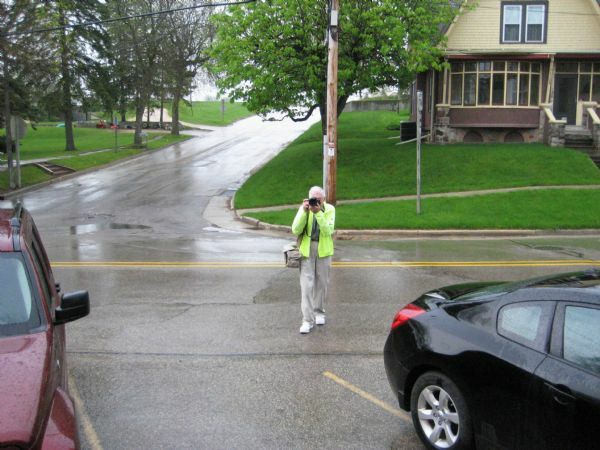 Jim Widmer photographing the exterior of The Marsh Inn for his fish fry series. Andy Kraushaar photographed Widmer at work on his documentary project. Kraushaar, Visual Materials Curator at the Wisconsin Historical Society, and Deena Brazy, his wife, took a trip to visit Jim and Shirley Widmer. While there, they took part in the Widmer's family tradition of going to Friday fish fries. Part of the series of photographs of fish fries in Wisconsin. See the photograph taken at the same time by Widmer at Image ID: 81573. See also Image 81575.